When Zing was created last year, she was done so with the vague notion already in my head that I would be main changing to this shaman. At that point she was destined to be restoration main spec as I was keen to see another side of raiding after player a caster DPS for years. Nearly every guide you will read will offer the same advice for shamans; level as enhancement. This was of no interest to me. Quite simple, melee DPS has never appealed to me. As such, from the very start Zing was levelled as elemental and yes, it was painful. 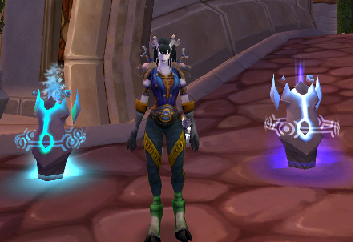 The character I had levelled before this was a warlock (when I did a reroll from Horde to Alliance prior to the faction change service). That warlock was levelled in a little over a week and was raiding Sunwell ten days after her creation date. With this in mind I started out very enthusiastically. I’m fortunate to have a lot of free time and I had wanted a shaman for such a long time that I envisaged her being eighty in no time at all. I think in the end, Zing took me close to three months to level. My actual play time on her was quite short but I found the whole experience excrutiatingly painful. At the end of the grind, I was happy though. I had my shiny new shaman and as predicted, I ultimately main changed from the warlock. While I’ve played both restoration and elemental as my main specs since then, the latter is currently my main spec as per our guilds’ requirements. Where is this story going I hear you ask? Let me explain. My guild raid four nights a week usually. Depending on where we are on content (whether it’s on farm or we’re working on something specific), dictates how fast we clear. When we’re clearing fast, a few hours a week are devoted to alt raiding. This is where my problem begins to arise. I no longer enjoy my warlock. I wasn’t enjoying her when I rerolled and nothing has changed. For those few hours a week, I despise raiding. Never the less in such a small guild, we really needed everyone with an alt to be available. I don’t enjoy alt raids. I don’t enjoy alt raids because I would rather be playing Zing. If I could raid two sets of raid IDs with Zing, I would enjoy them. I can’t raid two sets of raid IDs with Zing, therefore I don’t. I wish I could clone Zing. I can’t clone Zing but I could make a second Zing. Ladies and gentleman, please allow me to introduce Zinglet. As always, I was insanely enthusiastic about the idea of Zinglet. This enthusiasm soon passed at around level ten. It simply does not matter how many heirlooms I can buy to assist levelling, it’s too slow for my taste. And what spec is Zinglet? Yes, she’s elemental…..
Zinglet’s story is (hopefully) going to serve as a diary of levelling* as an elemental shaman and the problems and annoyances that face this class spec combination in the long grind to eighty! * This is assuming she does indeed reach eighty and doesn’t get abandoned to the Bermuda Triangle that is the entrance to Scarlet Monestary Cathedral.